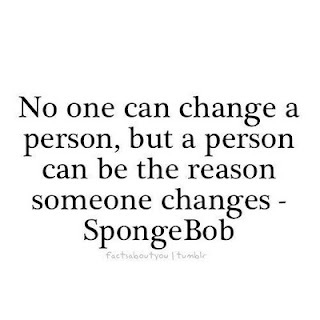 Who knew that a sponge that lives in a pineapple under the sea could be so wise?! HaHa. I know. I know. You are responsible for your own destiny - blah, blah. To a point I totally agree with that. I mean - it is overall true - don't you think? We can only feel sorry for ourselves for so long. We can only hold on to the pain our past caused for so long. We can only blame someone for "how we turned out" for so long. Eventually you have to stand up and say " I am the maker of my own fate. I must stop holding on to the past, it's actions and it's scars so that I can live life to my full potential" . If we hold onto all that anger and pain and blame for too long, we are just holding onto an excuse to NOT change. This quote is so true. On so many levels. I may only be 30-something and I know I have a lot to learn, but I am a walking example of this quote. I learned the hard way that you can not change someone that does not want to or is not ready to change. I learned that they will actually NEVER change unless they hit rock bottom and want to do it for themselves. I also learned that their actions can totally change the attitude you have on life, yourself, etc. They can destroy you if you allow it. 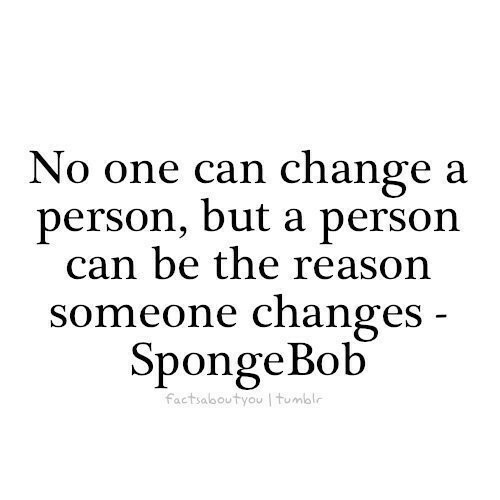 Many people from my past have been the reason I have changed. Not all those reasons are bad either. In most cases I have changed my thoughts, actions, life plan, attitude - for the BETTER. When I was in those horrible moments I certainly wasn't saying "thank you", but in a way I am now. I'd say that is true for a lot of people. I know that for me I am stronger than I ever have been when it comes to standing up for myself and what I believe in. All of that is due to being a door mat, having a crappy marriage, selfish friendships and a life time full of haters. The only negative for me as that it has made me TOO hard at times. I find I have a bit of a temper I never really had before when it comes to girls. I don't give an inch with them. If they "hate", talk about me, get smart- I snap in a second! I just have a zero tolerance level for that kind of petty crap. You don't like me - fine. Each their own. I would bet my life that you don't have a REAL reason. It's likely based on things you thought you knew, peoples false stories, jealousy, the fact that I didn't take your crap, or that I put you in your place for some reason - but I don't care. I also tend to guard my heart a little more than in the past. I have walls that are really hard to break down and have pretty much convinced myself that I don't need ANYONE ... when in all reality everyone needs someone to love them. Scars. Someone put them there and in return (in many cases) made us who we are today. Good or bad. Everyone has some sort of scars from their past. I guess it's just important to be able to make sure you are healed enough so that is all they are only that - scars! Something you can look at and remember they are there because you recovered!! You are stronger, better and wiser became of them. As for what we can do to make sure we are leaving healthy scars on people and not open wounds - I guess we all need to look at our own actions. Are we doing something that could cause someone to change who they are - for better or for worse? Remember that all depends on the person too. Never go into something saying you are doing it to "toughen them up" or "make them stronger". Not everyone handles things the same.